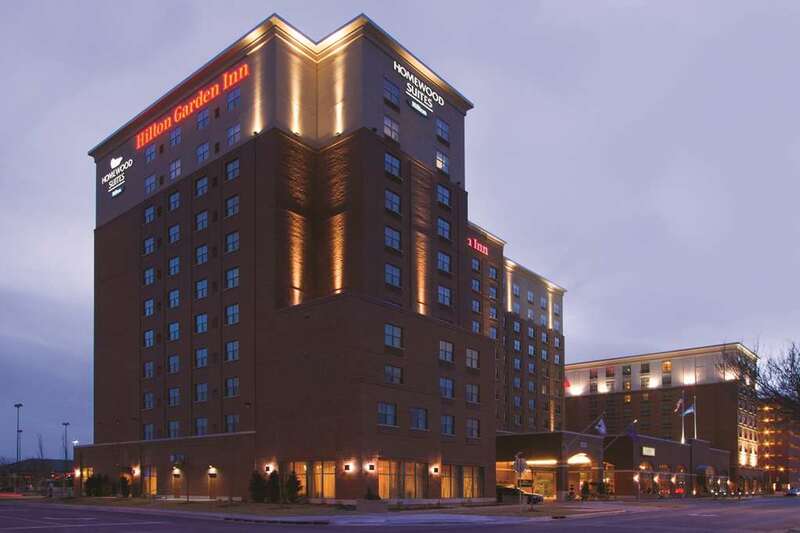 The Hilton Garden Inn Oklahoma City Bricktown is in the heart of Oklahoma City*s Bricktown Entertainment District. Located right across from the Chickasaw Bricktown Ballpark and within walking distance of over 40 restaurants and entertainment venues including - The Chesapeake Arena where you can watch world-class concerts or cheer on the Oklahoma City Thunder basketball team - The lively Bricktown Canal - The Oklahoma City Memorial - Museum - dedicated to the victims of the Bombing in Oklahoma City. - The Cox Convention Center - The Myriad Botanical Gardens - The Oklahoma City Museum of Art and many other fantastic attractions. Hotel Amenities Complimentary WiFi - Onsite Restaurant for Breakfast and Dinner Room service from 5pm - 9pm each night - Indoor Swimming Pool with whirlpool - 24-hour complimentary fitness center - 24-hour complimentary business center - over 4 000 square feet of Flexible meeting space - Pavilion Pantry for travel essentials and snacks open 24- hours a day. Room Amenities Tastefully decorated rooms with a range of amenities including a microwave and mini-refrigerator ergonomic desk and beautiful views. Pearl*s Crabtown: Pearl*s Crabtown is THE place for fun and food in Bricktown. Jazmo*s Bourbon St. Cafe: Jazmo*z Bourbon Street Cafe brings you the flare and fashion of good old N*awlins style with fine meals and nightly live music. Mickey Mantle*s Steakhouse: A classic steakhouse with a contemporary American flair in both menu and design. Spaghetti Warehouse: At Spaghetti Warehouse we make every meal feel like a celebration with the kind of delicious freshly prepared Italian food that everybody loves. Nonna*s Ristorante - Bar: Savor a unique Oklahoma city dining experience with an eclectic menu featuring only the freshest of ingredients to make your experience a tasteful delight. Tapwerks Ale House - Cafe: Join us for the LARGEST selection of beer in the State of Oklahoma. Enjoy the laid back style of an Olde English Pub located right in the heart of Bricktown. The Mantel: Welcome to The Mantel. Wine Bar - Bistro. We offer award winning fine dining in the heart of the Historic Bricktown Entertainment District in Oklahoma City. Chelino*s Mexican Restaurant: Best Mexican Food in the Oklahoma City Metro Area.